Harley has decided to be my helper as well - she can look out at the street when she is not trying to help type. The printer sent her into a tizz though - she is still so twitchy about noises. When Ian appears with the vacuum cleaner she is off and now when he opens the cupboard door where it lives she is off! I thought I would show a few pages from one of my sketchbooks - I had to answer a few questions for somewhere else (I will announce it when it appears) and I had these pics left. Working on the stones and fossils and stuff . and some more as well with a little TAP printed photo - all working in one of my khadi rag paper books. We have sold out of the regular ones and have only a few of the spiral ones left until October. Do I need another one yet??? This is more of the stitch to print and print to stitch idea. And a little drawing from patterns in Provence. I have used the pigments I bought in Roussilon. I have been packaging like a headless chook these last couple of days. Yesterday I did 200 Terrific Textures - just where do they go - and today I had to do a heap of the Little Yarn Bitz Bags and I can see I have quite a bit to do tomorrow for an order sitting waiting. I surely package on the hop until there is a show on the horizon! Just as well I am a list girl. The latest Cloth Paper Scissors appeared as well this morning - I think there are a couple of spares if anyone is interested. It is quite a good read this round. 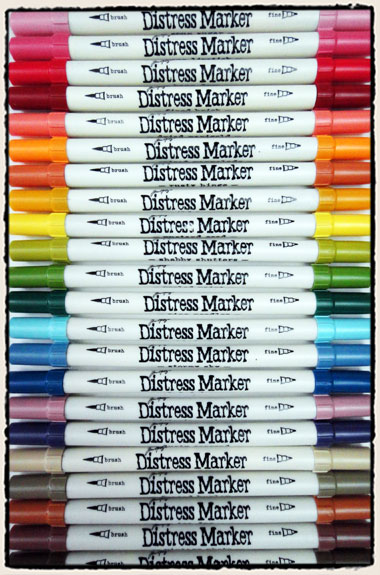 The most exciting thing, though, was that the Distress Markers arrived yesterday - wonderful! We have been busy this weekend but I don't have a lot to report - I did my demo on Sat morning which I think they enjoyed. One of the things I like when I do any demos is that my brain usually suggests ideas to have a go at - sometimes they work and sometimes they don't but it is important to do this isn't it? One thing which worked well for me was laying down a stencil on Tissutex surface which had been sprayed before with colour and ironing the hot spots onto it, lifting the stencil and then applying foil. Worked a treat and then someone suggested turning the stencil over and doing the negative. That worked a treat too. Just one minor problem. The stencil is proving stubborn to clean. Then we watched all the rugby - really enjoyed the Chiefs vs Highlanders game and sorry Ali - I was pleased the Highlanders won. Lots of nasty injuries though and it is only week 1. Got up this morning to watch the Hurricanes - they didn't do too badly but with lots of tackling ran out of puff and were a bit unlucky. 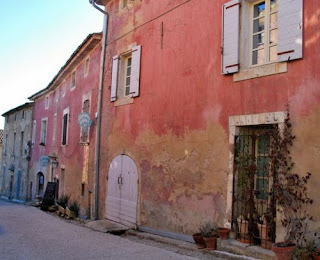 I have popped in this photo of in Le Luberon in Provence - I guess these are slightly more the colours I was thinking of - have spent some time studying the wool top sample and I do like it but I am still thinking. Today I have tidying up my studio and sorting my water soluble samples and getting ready for my workshop next Saturday. If you are in Perth and haven't done a lot of water soluble work, it will be a good workshop. There are a couple of places left if anyone is interested. You only need to bring your sewing machine and a bowl and a towel. We will be working on Romeo only - stitching, painting, moulding for starters. I have also been spraying Tissuetex and using stencils - wrapping the paper around the Tissutex - I am enjoying the effects and also using the gelli plate. I am a bit hooked on this thing. So my combo for working has been acrylic paint, Starburst sprays and shiva stiks - lots of interesting layers. All in the Marrakesh colours and I have just started drawing and playing with designs. 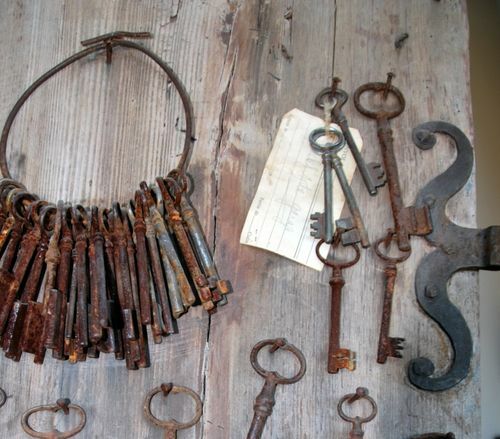 Also being a bit inspired by these keys. They would get lost in this house. 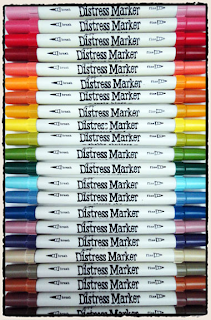 I spent part of the morning cutting and rolling flimsies and then decided to pull them all down and Ian put on the web one of each we have in stock. All this organisation is too much really but ever so helpful. Now I am wondering who is going to put them all back and sort them out? In the meantime I can hear a glass of wine being poured. The weather has been so much nicer this weekend. Maybe Summer is moving off. 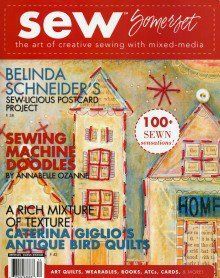 I also have a question to ask - currently we are now selling Art Quilting Studio and Sew Somerset from Stamington - both are popular - but I have had a number of requests to carry other of their magazines. Which ones would you be interested in? I value all of your judgements. I have been busy putting together stock to take to Innovative Stitches tomorrow where I am giving a 2 hour demo using such lovelies as Lutradur, Eveolon, Gelli plates, de Colourant, sprays, tissutex, Foils, Hot Spots, Cocoon Strippings and Rods etc. It takes me ages to get everything together becasue you always want to take plenty of samples for people to look at. I have just discovered that the spell check here on blogger no longer works. I an having to proof read carefully. Yesterday our thoughts were with the people of Christchurch - it was a year since the big earthquake - very difficult times. There are terrible disasters all around the world so it is often time to stop and ponder and be grateful for where we are at. Last night we went to the ACO concert - absolutely fabulous as always. We were offered a voucher for 2 free drinks after the concert so there we all were - hundreds of us, lined up for our free drink. Ian had been worried they wouldn't serve him because he was wearing shorts but no-one even noticed. Even Janet Holmes a Court was wearing jandals (fancy ones for sure but still jandals). Jacinta has sent me a trial slushie - Provence - what do you think? Playing with the gelli plate and paints and a new stencil - Circle Explosion - on Evolon - that fabric is one of my favourites - it does take colour so well. And I do love the layering you can achieve with the gelli plate. Hanging in for some stitching next. I love it when the parcel man or woman arrives with parcels especially when they are new goodies. Most exciting was the Gelli plates arriving - they took longer than everything else to make their journey. Boy the boxes of these are heavy mainly because the plates are heavy. I felt the need to have a play especially with one of the new stencils. When I counted the stencils I found 2 had managed to miss the post and of course some of you wanted those ones. Hopefully they won't take too long to get here. Then the new Dylusion stamps arrived as well including this set of Paris which is not part of the series but an indulgence for myself. I got a few more of course for those who feel like me.... 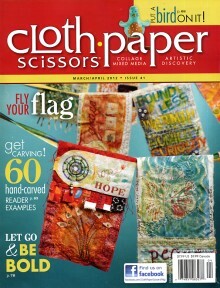 Here is the set of stamps below - nice and deep cut and easy to peel off and use. I don't use wooden based ones anymore and have started peeling them off - space is my problem but I have also found that if you cut up some of the big ones, they are great for texture etc. This is one of the Dylusion sets - they are quirky and fun - hopefully they and the Gelli plates will be on the web soon and i think there are some other goodies as well including a big express bag from Jacinta all coated in some slimey liquid - apparently another parcel broke open and spilt over lots of innocent parcels - I shall bravely open it up in a minute and see how the insides are. and here is the birthday boy's extra treat.
. We stayed in one of the cottages overnight - bit of excitement when the power went off for nearly an hour and we were out and about with torches. This is pomegranate - I am still deciding which one to play with first. At least my fingers are clean for the moment. 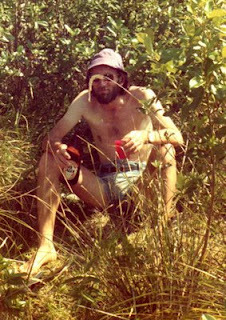 Happy Birthday Ian - you haven't changed a bit from those glorious days on Lake Rotoiti. Just changed from beer and what looks like a plastic cup to wine and glass. Today we are off to the hills to celebrate and back home tomorrow. and before we go I couldn't resist getting my fingers more dirty with dark colours this time. I wanted to have a quick play with my inks - these are my inks not anyone else's brand and I am still playing and testing. Actually waiting for the spray bottle samples is the most time consuming. On Friday I got bottles but no spray or top..... Anyway I am spraying ghosting and printing and having fun. This is my kiwi stamp having fun and a hand stitched stamp I made. A second one - you might be able to make out the stamp outlines - you can enlarge. Going for the slightly ethereal and of course the layers - which I love. I did say I was like a dog with a bone when I decide to do something - I have sprayed all the Starburst Sprays and tags and little mulberry paper roses for mounting onto a few boards. They do look beautiful if I may say so myself. Because all the colours are 2 tone you get a wonderful contrast shimmer. My fingers don't look quite so exciting though and we are off out to dinner - I will have to hide my hands under the table. It might seem that such a job shouldn't take too long but with 90 you get confused . but I didn't do any twice. I just had to get Ian to check with me at 80 to find the last 10. And I wrote the names on each tag. Some people complain that they are bored - I am thinking maybe they could give some of their surplus hours to me and i would use them wisely and their day would speed up. Good theory? This picture is not so easy to see but it is my collection of hearts on a machine stitched cord. 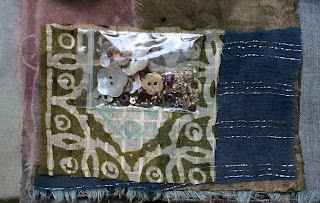 I am doing a lot of stitching this week for a purpose. No 6 - again a photo for a purpose. Looks great at night when the light is on inside. Harley has become the keeper of the front door and sits on the mat and doorstep - she loves watching the day go by so long as it is a wee way away from her. We have discovered that she is still sneaking into the fireplace for a few hours every afternoon - like a sort of nanny nap? You will all be so delighted to know that the rugby - super 15 - starts next week. There is a pre-season game on tonight at the park but I am not going - the others are. 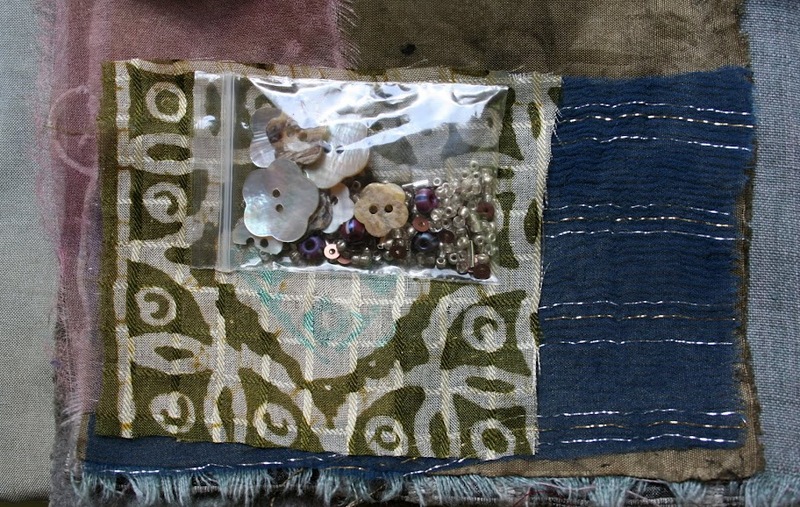 I am writing and stitching with a deadline. and maybe a glass of wine to help. and playing with my inks. Facebook - last time I looked we were 2 people off 1400. 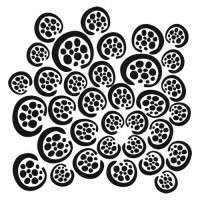 When we have 1400 likes I am drawing a name for $200 parcel of Victory rayon machine embroidery threads so some lucky person can do lots of free machine stitching too. I have stitched up a little heart or two just for the occasion. In fact I have stitched up lots of little hearts but they are all pinned out on polystyrene trays - a bit of prep for my Romeo class. Something to share with you - Did you know that Cleopatra so loved the colour purple that she once ordered each slave to obtain an ounce of purple dye for her? The dye was derived from a special, rare snail and each snail produced only 2-3 drops. It took years for her order to be carried out as over 60,000 snails had to be harvested in order to produce a single pound of her beloved Tyrian purple dye. The latest Studios arrived today and all the ones on the list have been posted out - there are a few left over if anyone is interested. 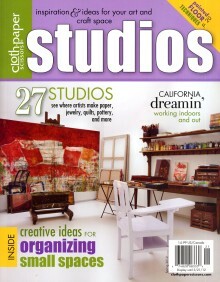 Quite a few studios in California - not anywhere where we were I can tell you. One studio which really interested me was that of Isabelle de Borchgrave - she is the artist who creates so much fabulous work (lots of garments) using paper. Scrumptious studio as you can imagine. And for you, Judy, the saga of the one armed specs. Some of you will recall that when I woke in Melbourne in my little cell one of the arms from my specs had fallen off. As a result, I had a new eye test (improvement rather than decline) and a new pair of specs was delivered to me on Australia Day the day we flew to USA. For some strange reason I also took the one armed ones with me as well. 7 days later as we were returning to the hotel to catch the shuttle bus, I tripped over a large thing in the disabled car park painted in the same colours as everything else (Ian said even he would have tripped over it) and landed on my face breaking my new unpaid for lens in two. I cried and I also had a black eye, lots of blood, sore right side, cracked knee and anything else which might take your fancy. Just as well we had that lovely upgrade is all I can say. Anyway I just had to take them back (they said they had never had a lens break in half before), pay for them and wait and wear my one armed ones in the meantime. I picked them up yesterday and won't even say what the second lens cost but I did get a decent discount. Now my one armed ones have gone off to be mended. The trouble with working is that tasks don't do themselves and this morning I thought I had better get on with one instead of just writing lists about it all. Our warehouse is quite long with partitioned sections and lots of shelves - at one stage it was a right mess especially at the back but a lot of time over time has meant it is pretty organised now. Except that when a shipment arrives, one tends to take it down there and dump it approximately where it should be. The second partitioned area is full of all the Moonglow stuff and a lot of fibre. This morning I spent quite a few hours sorting and placing things in the right places - still lots to do but now I know exactly what is there. The trouble is that there is no ventilation apart from the front door and I got to the stage where my glasses with the one arm only, kept falling off and I couldn't see out of them. Before anyone asks why I am still with the one armed specs, I will tell you tomorrow. The photo at the top is all of Jacinta's stuff - silk in alphabetical order in boxes and wool tops half sorted. Wool fibres especially, take up a lot of space. All of Martien's slushies in order and big containers below with the Moonglow sets in their right categories - this is how I found that I need to spend a lot of time this week packaging sets. On this side, Martien's wool tops all very organised and boxes of Starburst Sprays underneath. And finally, since I was all hot and bothered, I got Ian, when he called in to see how I was going, to turn a big shelf around - this is full of the Moonshadow Mists and Starburst Sprays. The trouble is that when I start putting all the packs together I will discover that I am low on stock so that will be more counting. But I have made room for a new shelf of sorts to fit. I still have quite a lot to do - all of Jacinta's slushies are lingering in another shelf not in this little area - they need semblance. And I haven't started sorting all the Corriedale wool packs. Oh well - another day tomorrow. As a reward I came home and started the completion of the writing of my next Let's Play book which hopefully will be ready in a few weeks. Tonight we are off to Tim Minchin. and this is yesterday's with foil between the Tissutex and kunun felt and stitched with metallic thread and kimberley dreaming rayon. I shall heat gun the back and see how it goes. It's been very hot today - 41 - but I do believe it is going to cool down over the weekend. Last night we went to Cantina to eat and their air con was not working can you believe? Hence we have been indoors with the air con on but I made a trip to the warehouse to start my tidying up of the fibre section - will go back in the morning and take a photo or two when I think it looks respectable. You package things and take them down in bags and dump them on the floor and then you can't find things when you need them so at some point it all becomes rather serious. I am feeling a little sanctimonious after my initial sorting this morning but I left as soon as I got hot - there is no ventilation in our long skinny building. I do love these Gelli plates though. People have been enquiring - they should be here next week. I am working on Tissutex and using the small plate because it suits my purposes. Building up layers. On the plate I have put Opulence paint and rolled it out and impressed a moulding mat and a stamp onto the surface and then I lay the Tissutex on the plate and pressed all over. Once it was dry I sprayed the back with Starburst Sprays. It's hard to show the depth of colour in a photo but take my word for it. This one I did differently - popped the moulding mat underneath and did rubbing with Gold shiva stik - then applied the colour to the plate and pressed a stencil over the surface. For one part i pressed the paper overt he plate with the stencil still in place and then I lifted the plate and pressed the paper onto the plate. Very pleased with this piece. I sprayed it on the back with Starburst Sprays. I am planning to stitch these tomorrow so will show you them again and see how they turn out. This bottom one is spraying with my new inky pinkies on the Qantas towel through a stencil. I am loving this ink experimenting and hope to be able to tell you more about them soon. Time for a Friday night glass of something nice and cool I think. and my naughty waterlily has decided to offer up another beautiful flower - maybe it likes Harley drinking all its water. She has learnt to actually stand on the rim of the container rather than stretch up to get her water. I have loaded a new taster for anyone interested - using my all time favourites. But I have also been further inky pinky -ing so I have inks allover my hands - they are dye like and hard to get off. Jacinta and I launched our Limited Editions and half have sold in a day - thanks so much - we are happy and will carry on - Jacinta has another lined up and I have one of my own all ready to go as soon as I get a moment. If you think about it, I could package, wind etc all day but I think I would rather work on the hop. Otherwise I would never get anything creative done in the studio and it is a bit of a mess so I am off to tidy things up - clear some space on my table so I can fill it up again. 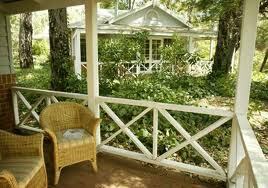 Yesterday we booked our flights to Canada for May - Air NZ had 25% off sale which was wonderful. So we are all set for a long long flight from Perth to Auckland to Los Angeles to Vancouver and then a short flight to Victoria. The last little flight I had to do through a guy at a call centre in India because AIr Canada woudln't play ball. Harley fancies herself as Ian's assistant, waiting to catch a mouse. There isn't a spot in this house where she doesn't venture. We are rather hoping her skills will extend to catching the rat which runs across the gate at the back every night, with one of his pals or family. Haven't decided it they live further back or further up. The first shipment of unbleached mulberry bark arrived yesterday - the bleached must still be on the high seas. Not much spare storage at present so I decided the bath was a good spot - fortunately we have showers but we do have a lovely claw foot bath now in use. Very pleased with this bark - it has taken me years to find it direct - all the pieces are quite different sizes but there is some lovely stuff there to play with. The Sew Somerset basically sold out immediately but so many people have emailed or phoned that I have ordered another lot. The list is already quite long but if you would like one, please email or phone and I will get it to you as soon as they arrive. Shouldn't take too long. It is a lovely magazine. I have finally launched the first of our Limited Editions - Venice - do check out the tag at the top. It is starting to get hot in Perth once again but we shall enjoy a bbq tonight and Harley is enjoying sitting outside with us at night with ears ever alert. It is interesting that some noises she has obviously programmed in now but anything new and certainly the tingle of next door's cat's bell, sends her rushing back indoors. I am still inky pinky playing with lovely inks but there will be a new taster up tomorrow.